As someone who has been known to frequently dabble in the kitchen and do a good amount of experimental cooking I am familiar with failure. I am also familiar with unintended success, that rare occasion where you create something so beautiful that you trick yourself into believing you are some sort of culinary genius. There is a moment in cooking where you realize you are just creating something. No one is telling you how to do it. No one is giving you a recipe. Nothing is measured. You are just putting things together, completely improvising, and creating something new. Something new to you at any rate. It's much like playing music in that moment when you realize you don't need sheet music or instruction and you can play some sequence of notes that just sound right even though it's completely new and something you invented in that moment. Then again, sometimes this leads to culinary disaster and great sadness. Tonight I got a supremely beautiful piece of grouper. I don't know that I've ever cooked grouper at home. I can recall filleting it on a few occasions in sweaty kitchens but I don't really remember ever bringing any home. When I saw how beautiful this looked I had to take it home. I was late in leaving work so I didn't get home until about 7:30 and had no idea what to do with this. After pouring through the fridge I decided to sear the fillet and finish it in the oven. In another pay I began cooking some Israeli couscous and tossed it with pepper, olive oil, chopped parsley and delicious tomatoes from everyone's favorite maggot-eating farmer. In the pan I'd seared the grouper I threw in some butter, browned it slightly, then toasted some garlic and chopped parsley to make a brown butter. 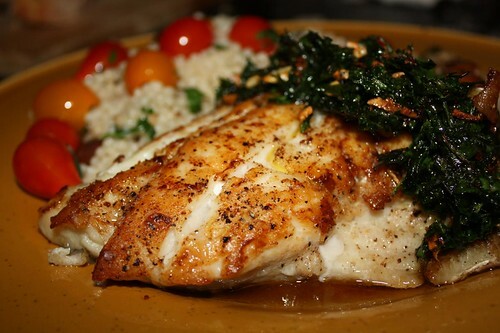 The parsley and garlic crisped up nicely and I poured it over the broiled grouper fillet when it was completed. In the moment I was sure that this was the finest meal I'd ever made. It was perfect in the moment. The entire dish had nine ingredients, that's including the salt, pepper, olive oil, and butter. I often enjoy the sport of buying one ingredient (grouper) and trying to work it into whatever is in the kitchen at home at the moment. What started as a lethargic and uninspired attempt at making something, anything, for dinner ended up as something truly beautiful. What better way to add to this overly dramatized dinner than with a completely inappropriate beer pairing? While in Vermont two weeks ago I picked up this Harvest Brown Ale from Long Trail Brewing Company, one of my all time favorite breweries. 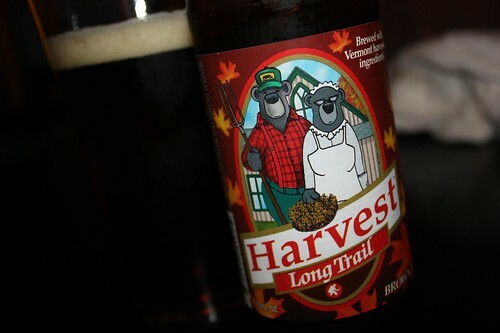 I'm fairly sure this would be among my father-in-law's favorite breweries based on their bear-themed labeling alone. They are in short demand in New York so I picked up their seasonal ale. It was extremely delicious, as has been my experience with all of their beers. It just wasn't really an appropriate match for this dish. But that's okay because I don't really believe in wine or beer pairing. I think, much like spouting off nonsense about "cherry notes" and "hints of tobacco" that you can achieve much more promising results with these two simple phrases: "I like this," or "I don't like this." Following that same logic (depending on whether a drink falls into the first or the second category) go enjoy some Pinot Grigio with a ribeye steak or cabernet sauvignon with seafood pasta. Knock yourself out. Now you are all graduates of Nate's Wine & Beer Tasting Academy. Now go out there and annoy your friends!